The 65-foot Estrella from HCB Center Console Yachts will debut at the Fort Lauderdale International Boat Show on Oct. 31. Billed as the world’s largest center console, the Estrella is powered by up to five 627-hp Seven Marine outboards. It has a master stateroom, cockpit-mounted projection TV and triple Garmin touch screens at the helm. The boat is available with a teak upgrade package, and HCB offers a Seakeeper stabilizer, a generator and fuel capacity up to 1,800 gallons. MasterCraft Boat Co. added the X22 to its wakesurf lineup. The 22-foot, 4-inch boat has space for 16 passengers with convertible rear seating and two aft-facing sundeck seats. MasterCraft said the boat has deeper stowage than previous models, along with heated space in the sundeck. The X22 comes with a folding gas-shock-assisted ZFT2 tower that can be equipped with board racks. Power towers are available. A Klipsch stereo is designed for maximum output. Dual screens are available for the dash. Standard power is the Ilmor Marine 5500 GDI V8. Higher-output versions are available. The boat can also be equipped with MasterCraft’s Dockstar Handling System. 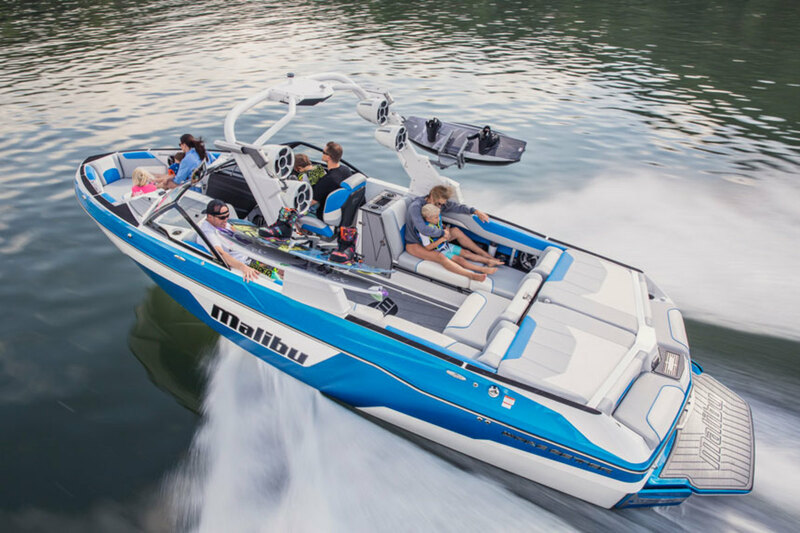 Malibu Boats introduced the Wakesetter 25 LSV. The 25-footer is the flagship of the LSV line, which is Malibu’s bestselling series of inboard towboats. It has a traditionally shaped bow, redesigned helm seat, dedicated cooler storage to starboard and increased space for gear. Wireless charging gives boaters a cord-free boost with three spots aboard the boat. The Multi-View Bench Seat can be configured in eight positions. Seating for 18 and about 5,000 pounds of ballast should let the Wakesetter 25 LSV throw some serious wakes. Malibu’s Integrated Surf Platform, including the Surf Gate, allows for customization of the wakes. Malibu’s Gx Tower can be raised or lowered and can be equipped with a bimini top, board racks and Rev 10 speakers.